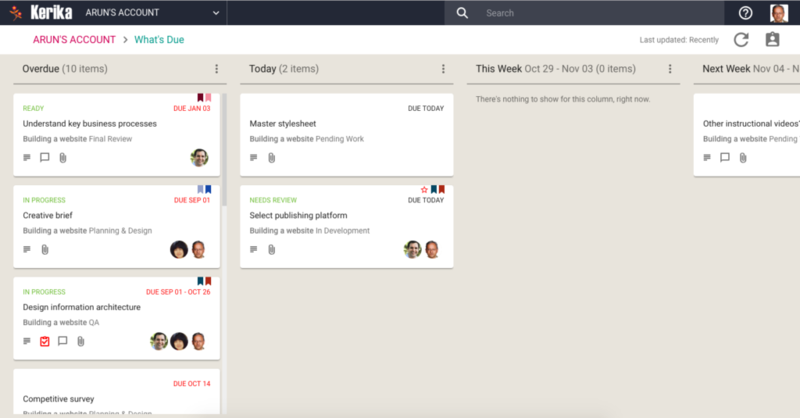 In the example shown above, several columns are hidden in this What Needs Attention view, and Kerika shows a count of how many items are hidden in each column. This can help you focus in on specific work items that need more attention than others. As part of our next release, which will include a new billing system, we will make it easier for you to move boards that you own to another account. If someone is leaving a team, it’s good practice to have their boards transferred to someone who will remain, so that ownership of project assets — the boards and all the content in the boards, including documents — remains with the team. More importantly, it is good practice to stay away from having individuals own boards, and instead use service accounts to be the single Account Owner in your organization. A service account is an omnibus account, typically set up with an email address like kerika@example.org, that isn’t associated with a single individual. A service account will never quit, never get fired, or take a vacation because a service account is not a real person — it is simply an account/ID used to be the permanent, omnipresent, owner of project assets so that team turnover doesn’t disrupt anyone. 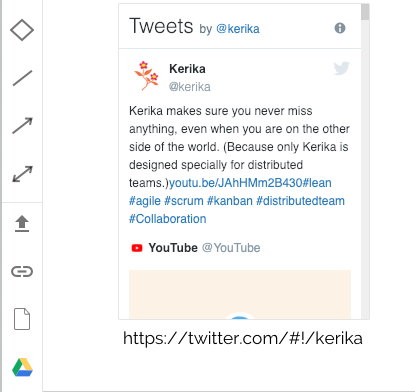 A list of “known collaborators” is presented to you by Kerika to make it easy to select a coworker with a single mouse click, but you can also move the board to someone else, who isn’t part of your current Kerika collaboration network. 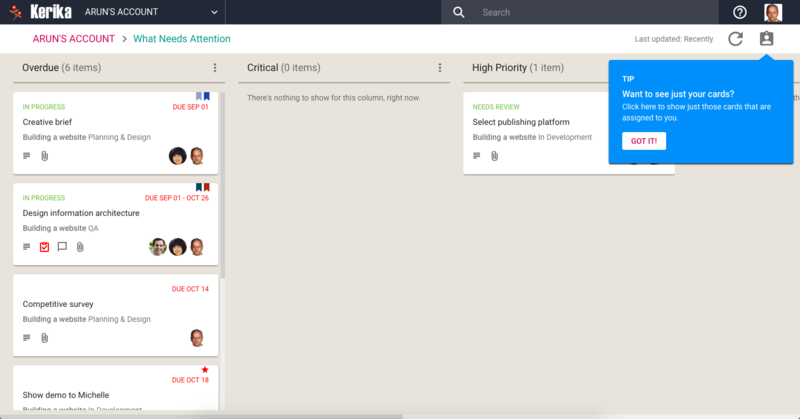 We think these improvements will make it easier for our users to manage their organizations boards, and move towards consolidated ownership for easier asset management. 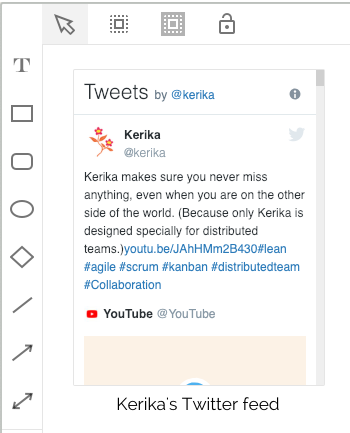 When the Kerika server is being updated (to a newer version), your browser will no longer keep trying to reconnect while this is underway. 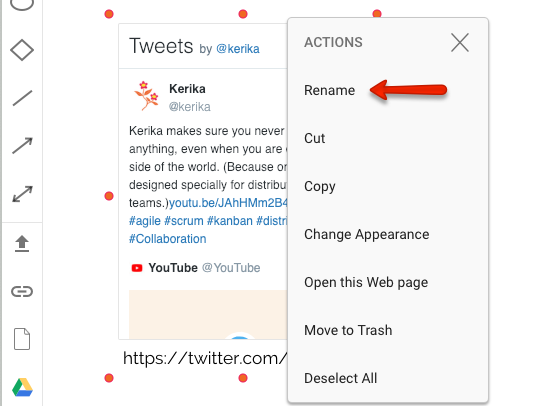 We have some code in place to help fix broken network connections: if your browser can detect that it’s connection to the Kerika server is broken for any reason (usually a network error), the browser will automatically attempt to reconnect. This doesn’t make sense if the server is down for planned maintenance. 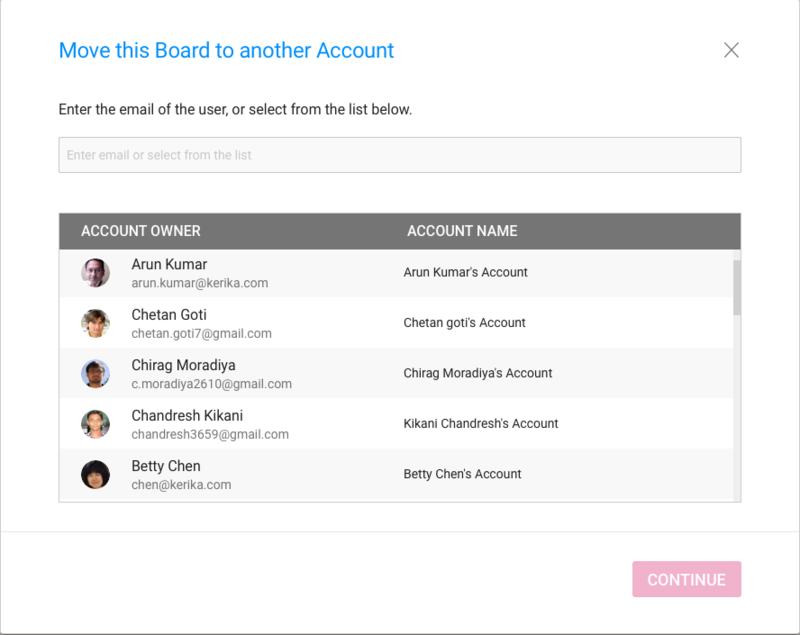 If you are working in multiple accounts and you decide to switch between them, we offer your choices in a more logical way: all the account owners you are connected to are listed alphabetically, and then each account owned is listed alphabetically. 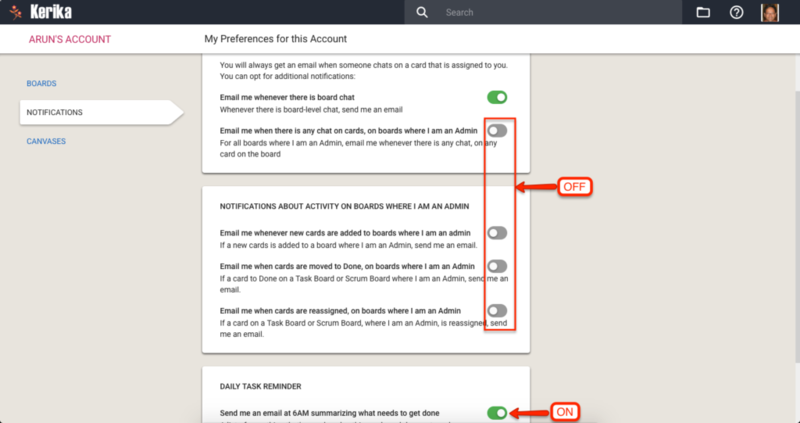 Now that we are encouraging our customers to converge around service accounts, we are trying to make sure these service accounts don’t get too crowded from the perspective of any single user. 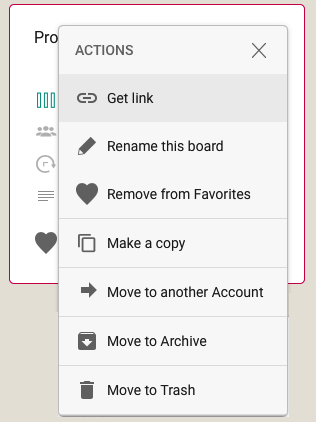 We have always had the ability to “favorite” some boards (and templates) so you can have your own personal, curated list of boards that you care about — and so you can ignore the rest — but now we have made it easier for Board Admins to move their boards to the trash or archive (or to restore them later) so they can help keep the commonly-shared service account in a more useful and relevant state for all the users within that account. 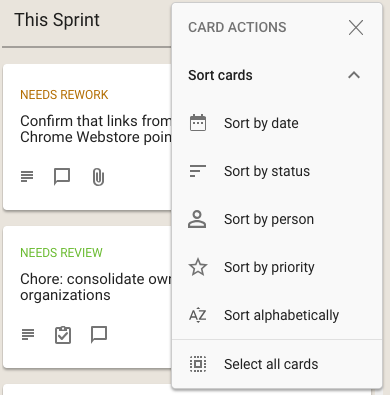 A really small thing, but we decided to change the Sort by Status feature on our Task Boards and Scrum Boards so that On Hold cards appear at the bottom of the column, below all the others. 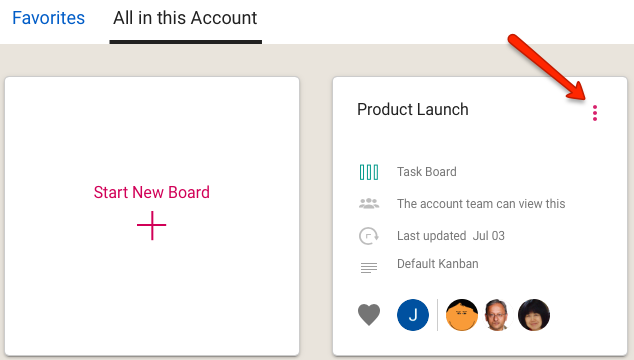 Bug fix: if you changed the name of a board using the Board Settings dialog (assuming you are one of the Board Admins), the new name is now reflected immediately in the breadcrumbs. 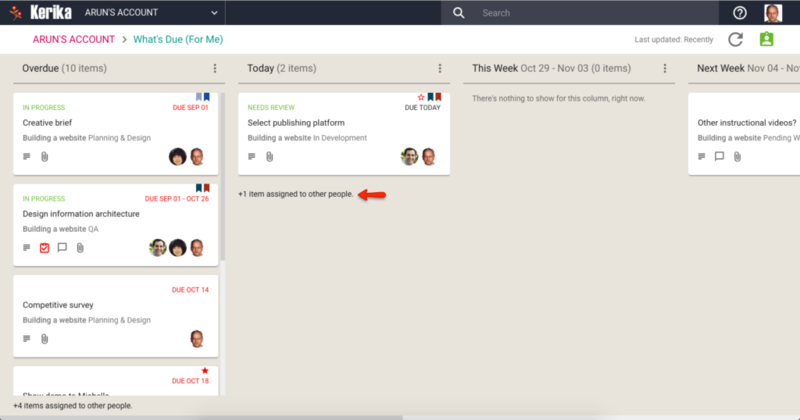 If someone who is currently a Team Member on your Task Board or Scrum Board is made a Visitor, he/she will not be removed from the current card assignments. 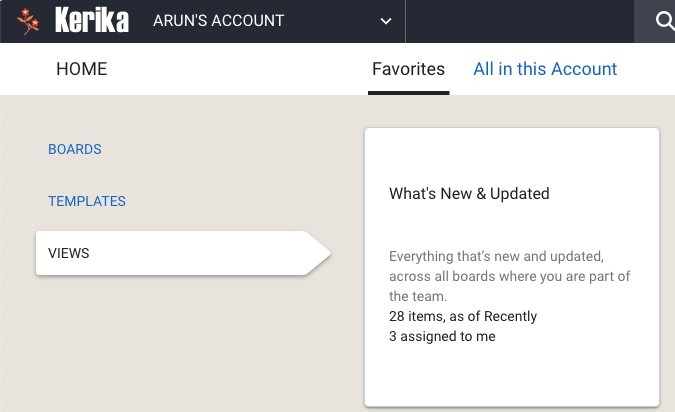 This makes it easier to change your mind if you decide you want that person to be a Team Member after all: just change this person’s role in the Board Team dialog, back to Team Member, and all the old card assignments will be there.